For today’s post, we’re doing things a little bit differently by exploring two games sure to test your tactical skills and adaptability to make the best of whatever hand fate deals you. Not only that, but you can play both of these games in less than ten minutes! Enjoy a double-shot of quick-play gaming as we look at Ricochet Poker from Hip Pocket Games and Button Men from Cheapass Games! Virtually everyone has played a hand or two of poker at some point. You know all about the secrecy, the bluffing, and the patient use of positioning, betting, and strategy to win the pot. Ricochet Poker turns the concept on its head, because there’s no bluffing. The game is played out in the open, and it’s more about playing the odds than playing your opponents. The goal is still to end up with the best cards at the end of the hand, but you get there in a different way. After each player antes one chip into the pot, you get a card. But this card isn’t a secret. It’s played face-up in front of you for everyone to see. 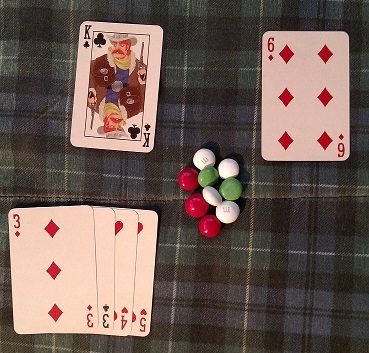 Now the player with the lowest card showing is the first to act. In fact, the player with the lowest card or hand is always the one in the driver’s seat in Ricochet Poker. On your turn, you can either fold or buy cards by wagering chips. Folding takes you out of this hand, just like in regular poker. Buying cards is a matter of playing the odds, since your goal is to no longer have the lowest card/hand by the end of your turn. For each card you want, you must put a chip into the pot. Here’s a sample hand. 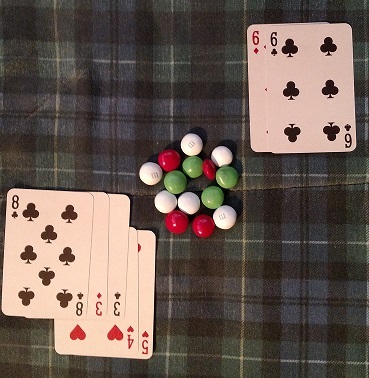 Each player antes one chip (with holiday mint M&Ms subbing as chips), and gets one card. From lowest to highest, there’s a 4, a 5, a 6, and a King. The 4 acts first, wagering two chips for two cards. Drawing a 3 and 2, this player is eliminated, since they still have the lowest top card. Play passes to what is now the lowest hand, the 5. Wagering three chips, this player draws a 4 and two 3s. A pair! She’s gone from lowest to highest and her wager has paid off for now. Play passes to the 6, who wagers two chips. 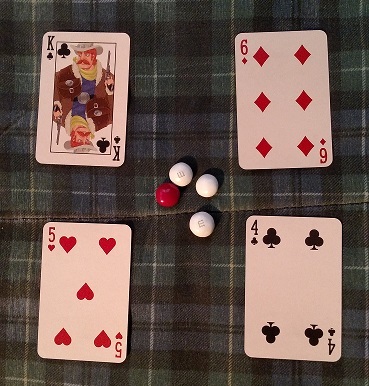 The first card is a 6, giving the player a pair of 6s and the highest hand, so this turn is over. Unfortunately, they’ve paid double for a single card. Play passes to the King, who also wagers two chips. 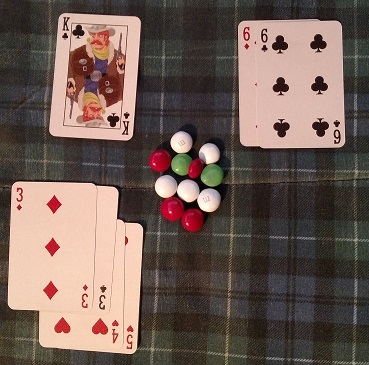 Drawing a 10 and an Ace, the King is eliminated, facing two paired hands. 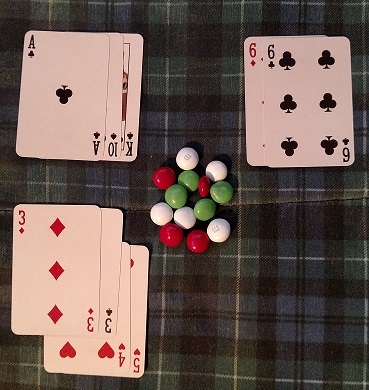 Play passes back to the pair of 3s, who can only wager one, since there’s a hand limit of five cards. (Of course, you could always play six- or seven-card poker, but we’ve stuck with five cards for this demonstration.) Unfortunately, she draws an 8, losing the pot to the superior hand. Play continues like this around the table, moving from lowest to then-lowest, until players have folded or busted by failing to top the next-lowest card on the table, and only one player remains. That player collects the pot. Button Men operates in a similar fashion, but adds dice to the equation to spice up one-on-one combat. In Button Men, each player selects a character from the deck, then rolls a handful of dice that represent that character’s potential attacks. Players then go back and forth, trying to remove dice from the other player’s hand in order to win the fight. The player with the lowest die roll is first to act, and they can attack their opponent’s dice in one of two ways, either taking down a die of lesser or equal value with a single die of their own, or using two dice to add up to the exact total of one of the opponent’s dice. Any losing dice are removed, and any winning dice are rerolled. He chooses another d8 for his set, and she chooses a d20 to balance his. They then roll all of the dice and see what they’re working with. Gilroy has two 2s, a 3, a 6, and a 7. Montserrat has two 2s, a 4, a 5, and a 6. Lowest value goes first, and since their 2s cancel each other out, his 3 (lower than her 4) makes him first to act. He captures her 5 with his 7 (thereby mathematically removing the chance she could capture his 7 with a 5-2 combination, the only way he could lose his 7 as the board currently stands). He rerolls the die and now has an 11. She replies by taking his 6 with hers, and rerolling, ending up with a 20. The momentum has now gone her way. He takes one of her 2s (the one rolled with a d8) with his 2 (rolled with a d8). This ensures both that, if she used that die against him, she couldn’t reroll it and end up with a higher number the next round, and that his own d8 would get rerolled, hopefully giving him a higher number. His gambit works, and he rerolls a 7. She takes his 11 with her 20, but then rerolls for 7. Both of the highest numbers are now off the board. He trades his 7 for hers (removing her d20 from the game) and rerolls for 7, a lucky break for him. At this point, it becomes a battle of attrition. She takes his 2 with her own, and rerolls for 5. That 5 is captured by his 7, and he rerolls for 4. She takes his 4 with hers, and rerolls a 1. He wins the game by taking her 1 with his 3. Even in this quick exchange, the advantage swung back and forth several times, and luck played as big a role as tactics. With dozens of characters to choose from — plus additional character packs, including soldiers, vampires, fantasy, and more — and a healthy pool of polyhedral dice to play with, Button Men is designed for endless replayability. If you need a fun, competitive way to open up a night of games, either of these clever and calculating offerings would be the perfect way to kick things off. Ricochet Poker is available from Hip Pocket Games and Button Men is available from Cheapass Games. Both are also available from participating retailers. This entry was posted in Games, PuzzleNation, Puzzles and tagged button men, button men originals, card game, cheapass, Cheapass Games, competitive, dice game, games, Geeking Out, Hip Pocket Games, James Ernest, poker, Pop culture, product review, PuzzleNation, Puzzlin' fool, ricochet poker, strategy by gmdirect. Bookmark the permalink.